Churches have a long history of using static outdoor signs to share scripture, broadcast words of wisdom, and spread messages of hope. Old fashioned letterboard signs have served churches well, but in the 21st century, their limitations are obvious.They're hard to read; letters often go missing; messages go unchanged for a week or longer. That's why more churches are turning to electronic message centers, which let them broadcast a multiplicity of messages in bold, dynamic fashion. 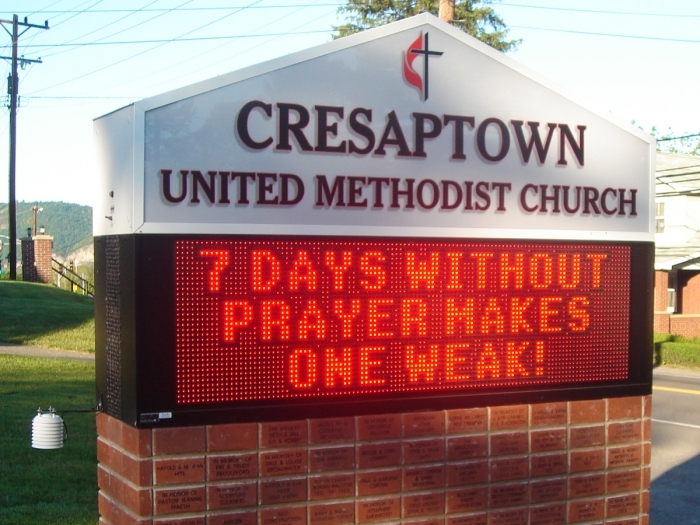 Keith Beeler knew an electronic message center could be a difference-maker for Cresaptown United Methodist Church. There was only one question: How to pay for it? As Cresaptown United Methodist Church approached its 225th anniversary, Keith Beeler had an idea of how to commemorate the occasion. “I thought it was the perfect time to get an LED sign,” he said. “What a great way to show the church is alive and going strong.” Everyone at the church wanted the sign, but no one was sure how to pay for it. That's when one of Beeler's colleagues had a novel idea: to sell commemorative engraved bricks for $225 a piece. The profits would pay for the sign, and the bricks would be used as a decorative foundation for it.